Two Chris Wood headers saw Burnley beat Cardiff 2-0 at Turf Moor to deepen the visitors' fears of Premier League relegation, writes Sky Sports. For Cardiff in 18th, their third Premier League loss in a row means they remain five points off safety with five games left to play ahead of their trip to Brighton on Tuesday. After a fast start, with early warning shots from both sides, Burnley had their first clear opportunity to break the deadlock in the 26th minute when a low strike from an unmarked Ashley Westwood was hit straight at Etheridge. Five minutes later and Burnley took the lead through Wood. McNeil's whipped corner - in the windy conditions - was met by the New Zealand international who directed his close-range header into the net. With ten minutes left of the half, Burnley could have gone two up through Westwood once again, but his low shot was expertly parried away by Etheridge. In the 47th minute Dean awarded Cardiff a penalty when Mee appeared to head the ball onto his own arm. But after consulting with linesman Darren Cann, Dean changed his mind to the disdain of Neil Warnock on the touchline. The decision fired the Cardiff players up and their biggest chance in the second half fell to an unmarked Junior Hoilett in the box in the 63rd minute, but he blasted his first-time shot over the bar. Burnley fought back and Etheridge had to make a string of fine saves. First, he denied Wood from close range in the 74th minute, before he tipped Mee's header from a corner over the bar. 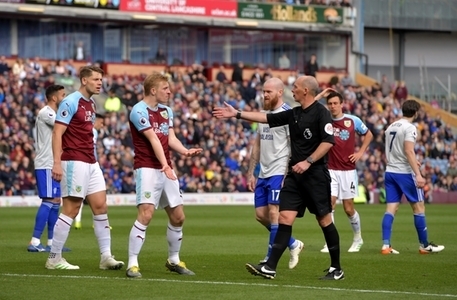 Referee Dean waved away appeals for a late Cardiff penalty when Bruno Manga's scuffed appeared to hit James Tarkowski's arm in the 89th minute. And in injury-time Burnley doubled their advantage through Wood, who headed in from close range to capitalise on McNeil's brilliant run and cross down the left flank. Burnley have won three consecutive top-flight games by a margin of two goals for the first time since October 1968 (a run of four). Cardiff have lost six of their last seven Premier League games (W1) after losing just three of the eight before that. Cardiff have lost consecutive matches against Burnley for the first time since the 1999-00 campaign in the third tier. Burnley manager Sean Dyce has never lost against Neil Warnock, winning five of his six matches against the Cardiff boss (D1). Burnley's Chris Wood has been directly involved in four goals in his last two Premier League games (3 goals, 1 assist), as many as he managed in his previous 11. No player has been involved in more Premier League goals this season as a teenager than Burnley's Dwight McNeil (8 - 3 goals and 5 assists, level with Ryan Sessegnon). Subs not used: Hart, Gudmundsson, Brady, Gibson, Ward, Vydra, Long. Subs not used: B.Murphy, Cunningham, Bacuna, Ralls.